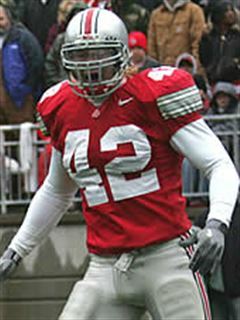 Ohio State fans know Joshua Perry as a talented WILL linebacker for the program from 2012-2015, who helped lead the Buckeyes to a national title in the 2014 season, and finished his career with 296 tackles, 18 TFL, 7.5 sacks, 1 interception, 8 passes defended, and 1 forced fumble.While that’s a nice legacy to leave behind in Columbus, Perry is trying to add to his story. 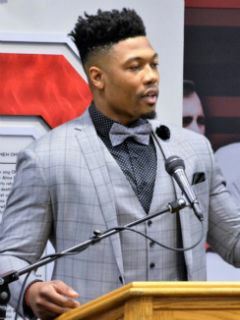 The Central Ohio-native, who has played for the Los Angeles Chargers and Indianapolis Colts since graduating from OSU a couple of years ago, has returned to the area to give back to the community, unveiling his new charitable foundation a couple of weeks ago.”The name is the Joshua Perry Family Foundation,” Perry told Bucknuts. “What we want to do is enrich the lives of young people through empowerment, self-efficacy, and education. Empowerment being the component of giving people tools and mechanisms that are useful in everyday life. The self-efficacy aspect would be the confidence and ability to use those tools. And then, education ties everything together.”Want daily inside scoop on the Buckeyes? Get VIP access with a 7-Day FREE Trial now! Perry, who has always been someone to be first in line to do community work, was inspired to start this venture from his own experiences, growing up in the area and then attending Ohio State. Outside of providing mentorship, what Perry is really hoping to do is help young people find passions and follow them, become leaders in those communities, and overcoming the obstacles that go along with that journey. “One of three things that really stand out to me would be chasing and finding passions,” he said of the goals for the JPFF. “I go into schools and ask kids what they’re passionate about. A lot of times kids don’t really know, and I think that comes from a lack of perspective, and not being able to see different things that you might become passionate about. “The second thing you talk about is building community-minded leaders. We want people who will take pride in their communities, be leaders in their communities, and then be able to groom the next group of kids who are coming up behind them. Perry has done a lot of the leg work to set the foundation up and get the ball rolling, but he’s not doing it alone. Some of the people that are getting involved are his old coaches and support staff at Ohio State, as well as some of the current players. Speaking of Ohio State, his time with the program and participation in the Buckeyes’ “off-the-field” experiences, such as Real Life Wednesdays and community service projects, helped prepare him to be able to make a dream become reality with this foundation. 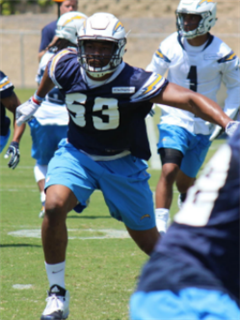 A lot of Perry’s focus is on developing the foundation’s efforts and starting to make an impact in the community, but he’s still chasing down his dream of playing professional football. “This is my baby and something I am involved with 100-percent,” he said. “Obviously, I have the board, which is really helpful. But I’m still playing ball and still have some other aspirations that I’m dabbling in right now. In terms of the down time and free time that I have, though, this is what I’m putting my energy and efforts in to. When it comes to his playing career, Perry provided an update of where things are heading into the upcoming season. As he waits for his opportunity to show the Colts and the rest of the league that he can bring value to an organization, he’s spending a lot of time in familiar territory, at the Woody Hayes Athletic Center. And while he’s there, he’s sharing some knowledge with the younger players, just as some former players did for him when he was with the Scarlet and Gray. He’s also been taking the chance to watch this year’s Ohio State team, and is excited about the potential for the 2018 Buckeyes. “There’s a lot of competition,” he stated. “This spring, it’s really hard to tell what the team is going to look like. Spring is always hard to tell because you’re not always padded up, not hitting all the time, and you’re throwing the ball a lot. Just from that aspect, it’s a little bit watered down, but there’s some great competition this year. Look in the secondary, linebacker room, quarterback, there’s competition going on. “At quarterback you have three guys who can really play. It seems like a lot of people are thinking it’s going to be Dwayne [Haskins] and Tate [Martell] (on the roster), but you look at Joe Burrow and you have to love his mentality. He’s a competitor and he’s not just going to lay down and give it away. He’s been spinning the ball really well in practice. I really think there’s three viable guys right there. “The wide receivers have been developing, which is great. “On the D-line, you have a couple of guys you need to replace at end, some really good guys leave there, but then you have Chase Young, who is good, Coop [Jonathon Cooper], who is good, now you have Jashon [Cornell] outside, and I think he’s going to do well. Those guys are developing. “Tuf [Borland] getting hurt at linebacker is going to hurt. 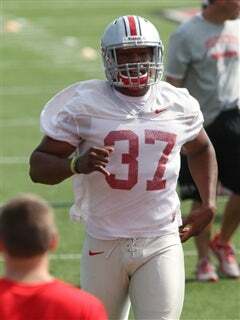 Hopefully they get him back as soon as possible, but you’ve got J-Hill, Justin Hilliard, who is doing a great job this spring. He goes really hard and he’s making plays. I was just talking to him, and he’s one of those guys who just wants to sit down and watch film, just wants to learn football, which is great. Then you’ve got Baron [Browning], who is going to be a great player. Keandre [Jones] is doing a great job. Pete [Werner] is doing fantastic. You look at the guys in that room, and they’re going to be great. “In the secondary you have some cornerbacks that can really play. Safety is going to be a position with competition, but those guys are all really good players and they’ll be on the field, whether it’s defense or special teams. Finally, with all of the new faces in the line-up for OSU this coming year, it is a bit similar to the 2014 team Perry played on that went on to win a championship. The linebacker sees parallels between that squad and this year’s.